This new reputation will become available with Season 13’s release and will feature all new traits, kit modules, space equipment sets and a ground equipment set. Increasing your standing with Competitive Wargames will require the submission of Competitive Marks. These marks can be earned by completing PvP and Competitive PvE matches. Assessed Stratagems can also be earned by participating in the Advanced and Elite versions of any queued event which rewards Competitive Marks. High-end gear projects will require a small amount of Assessed Stratagems in order to claim the best Competitive Wargames equipment. 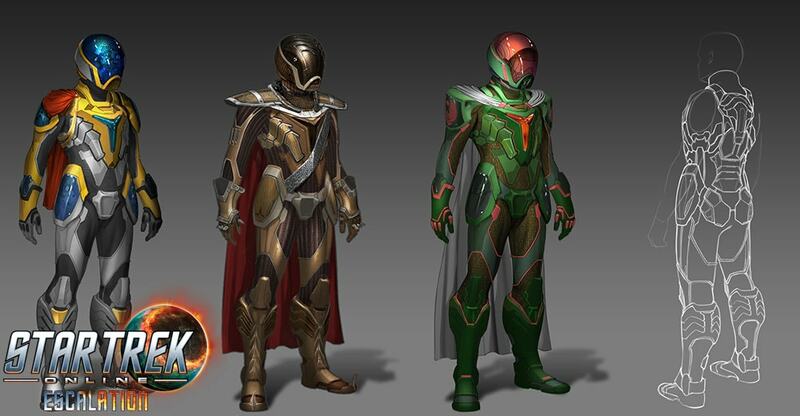 They may also be submitted to the Competitive Wargames in return for Dilithium Ore.
Each piece in the Prevailing Regalia set has three different versions, flavored for Innervated (Damage), Bolstered (Support), and Fortified (Protection). These different items will have slightly different stats, depending on which version you obtain. Captains can mix and match each of these items and still receive the full set bonuses - for example, the Innervated Impulse Engines and Bolstered Deflector Array will provide the 'Well Rounded' bonus listed below when slotted on a ship. If you choose to obtain one version of an item, you will receive a discount on the other two. For example, obtaining the Fortified Warp Core will grant you a discount on the Innervated and Bolstered Warp Cores. The Prevailing Warp Cores increase a subsystem’s maximum power by 5. Additionally, the increased type of power now contributes to a resistance based on the flavor of the core. Prevailing Singularity Cores increase a subsystem’s power levels by +5 to +15, based on your Singularity charge level. Additionally, the increased type of power now contributes to a resistance based on the flavor of the core. When at 10 stacks, gain +25 Bonus Energy Damage Resistance Rating for 5 seconds. Can occur once every 30 sec. Tetryon Support Directed Energy Weapons have built in support functionality - while maintaining fire on a target, it causes their armament cadence to become more suppressed, resulting in less abnormal concentrations of firepower. Tetryon Support weapons reduce the critical hit chance and severity of targets they hit. Large Stealth increase based on throttle speed. The lower your throttle, the higher the stealth value remains. Single target debuff ability that instructs all of your mines to slowly seek towards the affected target. If the debuff expires before arriving, the mines will stay where they currently are located. This Duelist Armor was built to rigorous competition standards and, like a great competitor, is able to adapt strongly when faced with an overwhelming threat. Player receives a large pool of Temporary Hit points when taking damage while their health is below 50%, allowing the player to survive a sudden burst of damage. The Duelist Shield has built-in dynamic attenuation, which increases its wearer’s physical and kinetic resistance rating. It is able to store these vibrations for later use – if the shielding fails, its wearer gains a boost to all incoming healing. The Duelist Tetryon Decompression Pistol was designed as a miniaturized railgun; its damage is split between being Kinetic and being Tetryon. Due to this, its firing rate is slower than some other pistols. The secondary fire uses charges and has a short activation time. Your maximum and starting charges will be 6 and will regain charges at a rate of 1 charge per 2 sec. Upon using your last charge, the secondary fire will go on cooldown for 5 sec and refresh all charges. This makes it ideal for all of the charges to be used at once rather than waiting on them to refresh. Modifies the Secondary fire of the Duelist Tetryon Decompression Pistol so that the last charge of the ability will leave a debuff on the target that increases the recharge time of Kit Modules and Captain Powers. If the target is an NPC it will leave a Disable on it instead. The Secondary Deflector is available in the three Secondary Deflector varieties, Inhibiting, Deteriorating, and Resonating. Enhances Sensor Analysis to decrease your target’s outgoing damage. Flak Shot Artillery targets in a 360 degree arc and deals heavy kinetic damage to targets in a 45 degree arc after firing. A portion of this damage will bypass the target's shields. Due to the spread on Flak Shot Artillery, its maximum number of targets able to sustain noticeable damage is limited. In addition to these equipment sets, advancing through the tiers of the Competitive Wargames Reputation will unlock access to a large array of Competitive exclusive consumables. New Short, Long, or Battle Duration consumables will be available through the Competitive Wargames Reputation. These consumables will offer options when facing other players competitively in PvP or Competitive PvE, and can only be used within those maps. Examples of Competitive Consumables include a buff that causes future player takedowns to apply a heal to you, or a consumable that gives a short duration critical hit chance buff after a takedown. There are also consumables available to allow you to place such things as a Sensor Disruption Pylon. Once placed, this pylon will lower the enemy team’s Accuracy Rating and Perception Rating while increasing allies’ Accuracy Rating and Perception Rating. Additionally, it comes equipped with an area shield that negates most damage that comes from outside of it. Launch a deploying Containment Field at your target. Once it reaches the target it snares them briefly and creates a Containment Field around them. If this barrier is crossed the target will be held temporarily and take heavy electrical damage. Flare Mortar creates a fixed position support platform at your location that launches blinding projectiles. In a larger area around the mortar, enemies have lowered Perception Rating and Stealth Rating, while allies will have increased Perception Rating and Stealth Rating and Dodge chance. Additionally, once every flare launches, a random enemy will be Exposed. Creates fixed position pylons at your location that, when near other pylons, create damaging electrical currents between one another. Attacking a foe that is affected by a damage immunity results in a short duration, armor penetration buff. Attacking a foe that is affected by a damage immunity results in a short duration hull penetration buff. When you kill an enemy player they drop a pick-up buff. Has a 5% chance to occur against non-player characters. Being hit with an incoming critical places a debuff on the attacker that reduces Critical Hit Chance for a brief period. Targeted Foe is turned to face you, pulled closer, and then has their front shield arc damaged. The Foe is then locked out from being affected by this power for a period of time. NOTE: All abilities and items found in this blog are subject to change.